Vassar’s oldest student theater organization, The Philaletheis Society, performed its adaptation of Peter Shaffer’s “Black Comedy” this past weekend in the Mug. Courtesy of Lindsay Matheos. 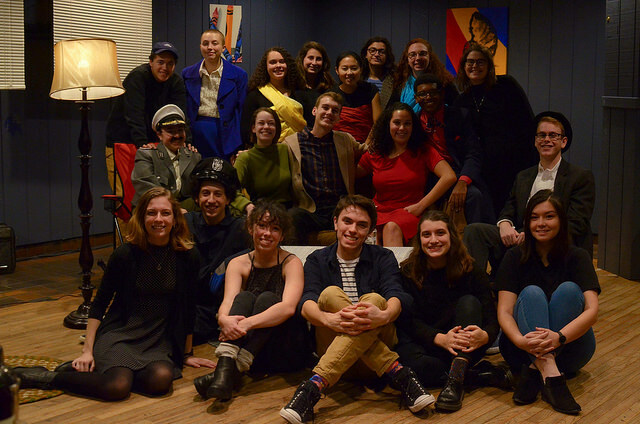 Last weekend, The Philaletheis Society, Vassar’s oldest student theater organization, presented their adaptation of “Black Comedy.” The play is a one-act farce written by English playwright and screenwriter Peter Shaffer and first performed in 1965. Philaletheis presented the show on Thursday, Nov. 1, at 8 p.m., Friday, Nov. 2, at 6 p.m. and Saturday, Nov. 3, at 2 p.m. and 8 p.m. in the Mug. “Black Comedy” follows the antics of sculptor Brindsley Miller and his fiancée Carol Melkett. The couple has borrowed expensive antique furniture and art from the flat of their absentee neighbor, Harold, without his permission. They do this in order to impress a wealthy elderly art collector coming to view Brindsley’s work, as well as Carol’s pompous father Colonel Melkett. A blown fuse suddenly leaves the apartment in complete darkness, and when Harold returns early and Brindsley’s ex-girlfriend Clea shows up unexpectedly, chaos ensues. The title of “Black Comedy” is a pun on the power-outage fiasco. The play is enacted under a reversed lighting scheme: it opens in a complete blackout, and once the fuse short-circuits, the stage is entirely illuminated. When actors use candles and other small lighters, the lights are dimmed. Julianna DeAngelis ’20, Sam Peterson ’20 and Alison Russell ’20 directed the play. DeAngelis wanted to make the experience as enjoyable as possible, explaining, “We had three directors, which was a little unusual, but we decided that would be a good way to help make the process more collaborative. We really just wanted this process to be fun and inclusive—the show is super fun and light-hearted, and we wanted that to translate to the rehearsal process. The playful energy of the show is also evident in the directors’ artistic choices. Although the production was not an original show, Philaletheis’ adaptation sought to reinvent the play. Developing new characters was one way in which the directors made the work their own.